Allow other users to help maintain the project and version settings. Allow translation or review by users who are not members of the global translation team for a language. Allow only your assigned translators and reviewers to work on the project. This requires setting Invite only. Delegate other users to help assign and manage translators and reviewers. View and edit the project team in the People tab. The People tab is on the project home page. The following roles are available in the project team. Each role applies only to one project. 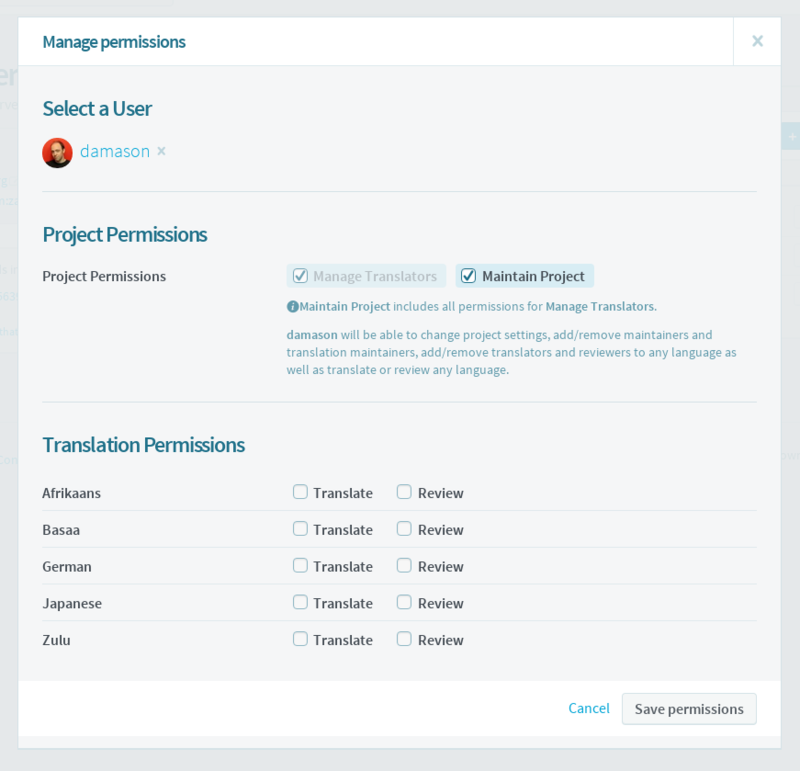 To gain permissions on multiple projects, a user must be assigned in each, or must join a global language team. Add and remove Translators and Reviewers for any language. A Translator can translate any document for any version into their locale. A Reviewer can translate and review any document for any version in their locale. Only admin, maintainer, translation maintainer are allowed. If you do not see the buttons, make sure you are logged in and you have the right permissions. If you do not have permission, you have to ask the maintainers to give you permission. Search for the user by typing their username or full name in the text box. Select the user when they are shown in the search results. Click the role or roles that you want the user to have. The user will be shown in the list of people, with their new role or roles. Open the People tab for the project. Click "Manage permissions" next to the person in the list. Click the roles you wish to add or remove. To remove someone from the team, just remove all their roles. The button in the "Manage permissions" dialog will change to show that the person will be removed when you save the permissions.